The above components or variations of them are installed permanently in the vehicle by qualified technicians using wherever possible the original vehicle components to tap into or affix to. There are a range of tank sizes available from 30 to 200 litres which can fit as a replacement for an existing fuel tank or spare wheel or "torpedo" tanks fixed to the underside of the vehicle with steel brackets. 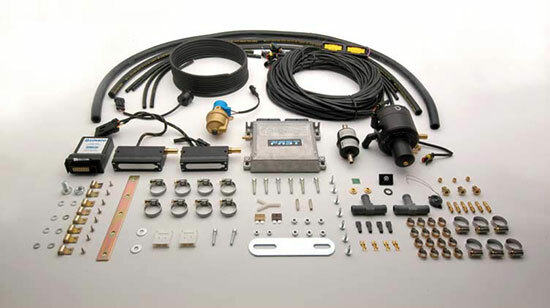 The systems are generally supplied in complete individual kit form according to the vehicle make and model from a number of specialist European manufacturers. LPG is supplied in liquid form under low pressure (10 bar) into the tank via a clip on nozzle from the fuel retailer. It rests in liquid form in the tank and is then piped up to the engine compartment still as a liquid to the evaporator unit. At this point it is converted to a gas using the heat of the engine coolant to evaporate it. Then fed into the intake manifold of the engine either as a single large injector or via multiple sequential injectors depending on the type of system. The flow is regulated by vacuum servo units and electronic control units that are designed to link into the original vehicle EOBD (european on board diagnostics) system. This method ensures complete system compatibility whilst retaining all the functions of the car's own electronic control and diagnostic systems. The system is switched from petrol to gas automatically when the engine coolant temperature and other parameters are met whilst driving normally. Generally with modern sequentially injected systems the change is imperceptible.